L-R: Deanna Kelly, Eunkyoung Kim, and Greg Payne. Inventor not pictured: Mijeong Kang. A phenomenon called oxidative stress is thought to be linked to a number of diseases including cardiovascular disease, Alzheimer’s, and schizophrenia, among others, but current methods of measuring oxidative stress for diagnostic purposes are costly, slow, and provide limited results. However, University of Maryland researchers have invented a tool that detects biological signatures in blood that measures the level of oxidative stress in a patient. The standard techniques to measure oxidative stress in clinical samples generally involve measuring individual antioxidants, a costly, time-consuming process that can potentially miss important markers for diagnosing or treating diseases. The UMD research team’s method applies the power of signal processing to chemical analysis, enabling a rapid and adaptable diagnostic tool. The process can be likened to sonar, where sound pulses are emitted and then measured based on the reflection of sound, or an echo. To detect the level of oxidative stress in blood, the researchers use an electrode to transmit a reduction-oxidation (redox) signal and allow the transmission to undergo redox interactions with components in the sample. The researchers then measure the “reflected” redox signals – like an echo – that result from these interactions and interpret them using information processing methods. The process measures oxidative stress at a global rather than individual level, a cheaper and quicker technique. 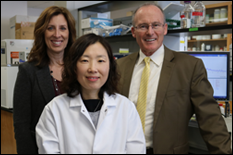 The invention, called “Transformational Electronic Tool for Chemical Analysis: Oxidative Stress Detection,” was invented by: Payne; Deanna Kelly, professor of psychiatry and affiliate professor of pharmacy practice and science at the University of Maryland, Baltimore’s School of Medicine; IBBR Post-Doctoral Associate Mijeong Kang; and IBBR Research Associate Eunkyoung Kim. The team’s first application of the new technology is to detect signatures of oxidative stress in people living with schizophrenia. In addition to clinical diagnostics, the team envisions their research being applied to homeland security and defense since it provides new sensing capabilities. The inventors are currently working to further hone their research before moving to commercialization. “Transformational Electronic Tool for Chemical Analysis: Oxidative Stress Detection” has been nominated for the Invention of the Year award in the life sciences category, for which the winners will be announced at the 2018 Innovate Maryland celebration on April 11.